For Immediate Release – March 2, 2015 - Rancho Mirage, Ca. – The Desert Guild of Big Hearts for Little Hearts of Loma Linda University Children's Hospital hosted an elegant dinner at Toscana Country Club in Indian Wells to celebrate the launch of their $ 1.5 million Endowment Campaign for pediatric research. Gifts that can support this Endowed Chair can include annual gifts, major gifts, as well as planned gifts. This newly-announced Endowment Campaign is a project created and championed by the Desert Guild of Big Hearts for Little Hearts. The Woolley-Pettis Endowed Chair for Pediatric Research will support research and teaching at Loma Linda University Children's Hospital. 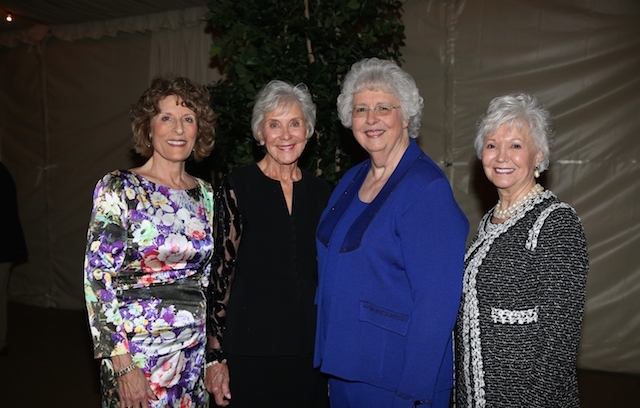 It honors E. Jane Woolley, MD and The Honorable Shirley Pettis Thompson, two visionary women who co-founded the Desert Guild of Big Hearts for Little Hearts 13 years ago. "The Desert Guild of Big Hearts for Little Hearts is committed to providing medical care for the children of the Coachella Valley," stated President of the Desert Guild D. Joyce Engel. "Last year, the Desert Guild voted to raise the needed funds to establish an Endowed Pediatric Research Chair at Loma Linda University Children's Hospital. This will ensure that critical, state-of-the-art medical care will be made available to our local children," Engel continued. Over 125 elegantly-attired guests were in attendance to help to raise much-needed funds to support this important Endowment Campaign. Lydia Mladenovic of the M Group Events created the evening's beautiful décor. "We cannot think of a better way to find the cause and a cure for disease than to fund a Chair for Pediatric Research," stated Event Co-chairs Bonnie Timarac and Bobbi Reiman. Jenifer Daniels, Morning News Anchor of CBS Local 2 TV served as Mistress of Ceremonies. President of the Desert Guild of Big Hearts for Little Hearts, D. Joyce Engel thanked everyone involved in the event for their support and hard work. She then recognized the Founding Members in attendance including Mardell Brandt, Donna Warren, Veloris Lang, Dale Rotner, Patti Wallace, and Joan Woerhmann. Keynote speaker for the evening was Adrian Lavery, MD, MPH, Director of Neonatology-Perinatal Fellowship Program, Division of Neonatology, at Loma Linda University Children's Hospital, whose comments included why Loma Linda University Children's Hospital is a special place, why pediatric research matters, and the enormous significance of this first Endowed Pediatric Chair being established by the Desert Guild of Big Hearts for Little Hearts. "By creating this Endowed Chair, your Guild is creating a perpetual fund," stated Dr. Lavery. "It is one of the highest honors given to an academic institution, which allows for the funding of important projects which will improve the care of children in our future. This could not come at a more important time because funding for research is so very limited at both the Federal and State levels. Furthermore, an Endowed Chair will allow us at Loma Linda University Children's Hospital to support projects that many other sources would not fund. Much of what we do at Loma Linda University Children's Hospital is not reimbursed by insurance companies. We give away a lot of expensive care regardless of anyone's ability to pay. We are doing important research, and teaching the next generation of neonatologists," Dr. Lavery continued. Jeanne and Lou Mace, long-time supporters of the Desert Guild and Loma Linda University Children's Hospital since 2003, kicked off this Endowment Campaign by announcing their lead gift. The Maces have included this significant endowment within their estate plans and have designated a portion valued at approximately $ 500,000.00. The Maces have worked tirelessly as advocates for the best children's health care. Jeanne Mace is a past president of the Desert Guild of Big Hearts for Little Hearts of Loma Linda University Children's Hospital. Other generous endowment pledges have been received from Roy & Bobbi Reiman, E. Jane Woolley, MD and Morton Woolley MD, Mary Ann & Frank Xavier, and Dr. Doralee Bailey. Event Sponsors for the evening included Sherry & Mac Gerschwind, Jeanne & Lou Mace, Bobbi & Roy Reiman, Bonnie & Ned Timarac, and Kathleen Venturi. Media Sponsors included PALM SPRINGS LIFE MAGAZINE, CBS Local 2 TV, ABC TV, FOX, TELEMUNDO, CW PALM SPRINGS, MONEY RADIO 1200, THE COACHELLA VALLEY BEACON & VALLEY WOMAN, and Madeline Zuckerman Marketing & Public Relations, Inc. Since the inception of the Desert Guild of Big Hearts for Little Hearts in 2002 by E. Jane Woolley and The Honorable Shirley N. Pettis Thompson, the Desert Guild of Big Hearts for Little Hearts has become a trailblazer for ensuring critical funds for children of the Coachella Valley at Loma Linda University Children's Hospital. The Desert Guild of Big Hearts for Little Hearts' goal was to build a support base for the hundreds of Coachella Valley children who seek treatment for serious inpatient and outpatient medical issues at Loma Linda University Children's Hospital each year. More than 30% of children transported to the Pediatric Intensive Care Unit of the Hospital are residents of the desert communities, a statistic that many people are not aware of. In 2014, over 100 patients from the Coachella Valley on a monthly basis were treated at Loma Linda University Children's Hospital. These Valley children are air-lifted to the hospital from local hospitals in partnership with local physicians due to the urgency of their needs. The Desert Guild of BIG HEARTS FOR LITTLE HEARTS since its founding has raised more than $ 1.6 million to ensure critical medical care for the children of the Coachella Valley.